16-Aug-2009 - Complaints and problems with this tutorial have been showing up on other sites, and I have only been finding out by accident. If you have complaints or problems with this tutorial, I ask that you please CONTACT ME. If you have the time to address issues regarding my tutorials on other websites, you have the time to contact me in some way as well (or beforehand) to let me have some input on the thing I spent time making. Contacting me is not difficult and I can probably resolve whatever the problem is. If you need a version that is printable/higher res/etc. I can send it to you or upload something here. If you need help with steps, post a reply here and I can try to help as I have done for others with all of my tutorials. If you have complaints of any sort, contact me via whatever method suits you best. For those who are just visitors and can't post on this site, my e-mail address is right on my profile/main page here, easily accessible to anyone. It starts with a FAST overview of the bird base. In the comments for that video, I have linked to slower tutorials that beginners may find easier to follow. And however many months/years later and sufficiently many requests...HERE IT IS. It should give enough information for people that have had a bit of folding experience. There is one fold that is very counter-intuitive for most people (step 12). I appologise for the non-standard folding arrows and such. At some point I will need to redo this as diagrams instead of photographs so I can show cutaways and such, and then I will be able to sort out the arrows better than I was able to using MS Word. A note unfortunately: seems I forgot to include the detail on how to fold the "arm" part of the wing over to mak it visible from more than underneith. It's not very hard, and I don't always do it depending on the type of paper. If you use foil paper, it works very nicely. Thicker paper...not so much. Folding the arm over may simply undo itself on difficult papers. In the final image, you can see that I only folded it halfway to emphasize the shape of the arm without flipping it all the way. To me it's not complicated, so I would expect that other people have happened across similar to nearly identical patterns. However, I did develop this myself with no significant references (other than a standard crane deisgn) and therefore hope that my choice of details is at least somewhat unique. If you follow this tutorial to create a dragon and wish to post the result as artwork either here or elsewhere, please credit the design you used to create the dragon. I'll edit this comment when I've got it. Oh well. It was fun. Lacks clarity. Not enough steps pictured nor sufficiently specific instruction given to compensate for the lack of picture guidance. I don't understand the bit about folding down on the rabbit ear I can only fold up! Can you link me DIRECTLY to the dragon tutorial video. I'm on my iPad so it won't play playlists and it makes the typing look blurry on the instructions so I can barely read them. Everyone at school is amazed at such a simple thing. This is really cool! LOL LOL oh this comment made a part of my day. omg best dragon tut. i've found!!! Do you have some video to see the whole process? People fold paper into a paper dragon. That's cool. But the people who actually developed the design... now that's amazing! This is a great model. The first time I tried to make it I used regular printing paper, which was tough, but manageable. Next, I want to try foil paper. oooh I love dragons! Thankies for the tutorial! 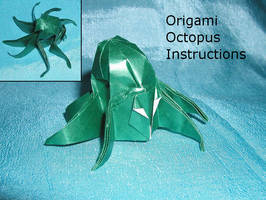 awesome I love origami! I made a mini family of them. I'm trying to make one, but suddenly after two hours of mistakes and not neat folds I realized it wasn't the best idea attempting to make one at 2 am. Again in the morning perhaps? This is an adorable little dragon! I made one for my mom. i love to do it . but i can't understand honestly. Hi! I really love your origami tutorials, and right now I'm having a hard time trying to do the neck fold (step 8) of this dragon... Every time I try to push it up, everything (meaning the future legs) goes up too! I didn't think I was gonna have problems with this model, since I already did something similar to step 12 on a sea turtle.. But the neck caught me =/. I'm still trying.. If there's a tip, I hope you see this message soon^^. Wow, I Love tis tut!!! I hope you like it, gave it some spikes on it's back! there are many origami dragons with the similar diagram pattern but urs had the best wings!! I like this, it's actually pretty straight forward. good on you. I may have to try this out sometime. I've got to make one for my husband some time - He loves dragons! in step twelve is that (looks like) a modified squash fold?? Dragons are awesome... Nice tutorial! Wow! Paper Dragons! Now my room will drown in them. Cranes are nice but how about 1000 dragons? will it grant me a magical wish? I love this. My boyfriend loves dragons, so now I can make him one as a little gift.